Lots more Karen silver in the Beads, Findings and Pendants sections. 1 Karen Hill Tribe Silver Fishy Charm with Loop detail on both sides this charm measures approx..
1 Karen Hill Tribe Silver Paisley Leaf Charm with Hanging Loop detail on one side measures appr..
1 Karen Hill Tribe Silver Hammered Heart Charm with Hanging Bail this was originally a flat pie..
1 Karen Hill Tribe Silver Small Leaf Charm detail to one side with a loop at the top for hangin..
1 Karen Hill Tribe Silver Heart Charm with stamped flower detail on one side. Measures approx 1..
1 Karen Hill Tribe Silver Swan Curl Charm looks a bit like a swan or an S or something uncurlin..
1 Karen Hill Tribe Silver Leaping Dolphin Charm with hanging loop detail on both sides measures..
1 Karen Hill Tribe Silver Mini Rose Charm with hanging loop measures approx. 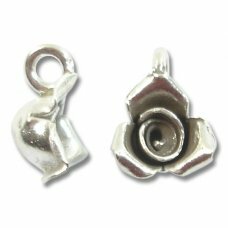 12.5x7mm inclusive..
1 Karen Tribe Silver Little Flower Charm with Hanging Loop these are so sweet! Measure approx. 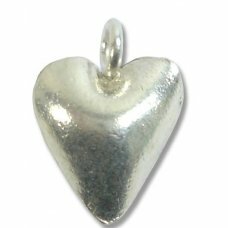 ..
1 Karen Hill Tribe Silver Stamped Heart charm with Hanging Loop stamped on both sides great as ..
1 Karen Hill Tribe Silver Open Heart Charm measures approx. 18x15x1.5mm inclusive of the hangin..
1 Karen Silver Swirl Charm; a lovely, heavyweight little thing - detail on both sides with a loop at..
1 Karen Hill Tribe Silver small puffed heart dangle. 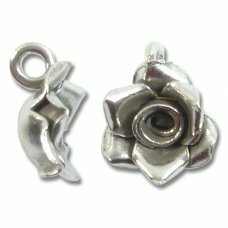 This heavy solid silver dangle measures ap..